Have you ever seen a toilet unique, maybe ever. But have you ever seen a toilet that is truly unique and strange, this may rarely be found. Generally, the toilet has the same design or shape throughout the world, although there are differences in form, it does not surprise us to see it. However, very different from the design of toilets below, would like to know how your form, please look at the picture below. This type of toilet in the category of the most unique toilet first. This is evident from its unique design. For those of you who go into the toilet, you will be able to see people who are outside, but those outside can not see you. How unique is not it! The most unique second toilet is a toilet with a pictorial design of the mouth. For those of you who are want to throw dirt, would be laughing because it seems your dirt into the mouth. 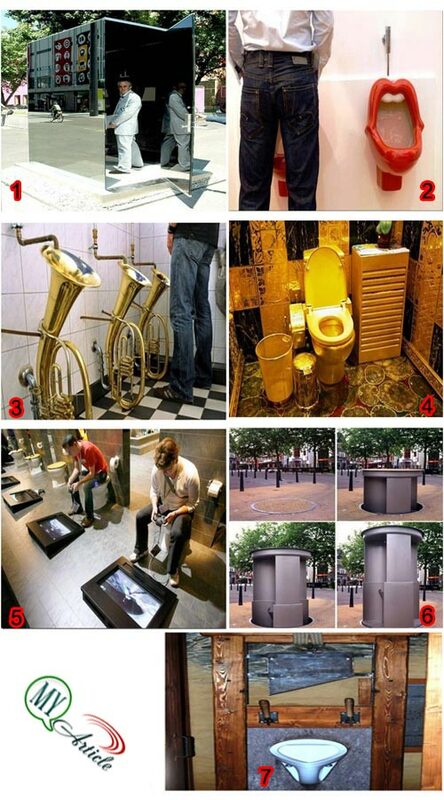 The toilet may be well suited for those who love to be a trumpet. Certainly like to play the trumpet will be channeled to the maximum if the toilet is also designed with the shape of a trumpet. The toilet is actually not only unique but in the category of exceptional and I am sure if the toilet is not maintained with high security, it is concerned that the only remaining trash only. It is a kind of modern toilet where you can play PlayStation while defecating, except that the conditions inside the toilet is also very comfortable at all. would you be surprised if suddenly you see in a big way there is a toilet that appeared suddenly, the toilet has indeed been designed like that. Toilet is in London, at night the toilet would appear, but if it is morning, these toilets will disappear. Toilet is very suitable for the corrupt or those who commit crimes.